← Demanding the Impossible: Saying “No Compromise” in the Climate Movement, And Meaning It. There are a number of important lessons learned from the fight against Keystone XL. Perhaps most importantly, that the climate movements picked a fight scoffed at by lobbyists, politicians and pundits, dug in, fought hard and won (at least partially). The broad coalition of Indigenous groups, Nebraska and Texas landowners, students, environmentalists and many more challenged the huge amounts of political and social capital that Big Oil has in our society and fought back. In August 2011, the Tar Sands Action launched the first major escalation against the Keystone XL pipeline. Responding to a call to action put out by environmental writer Bill McKibben, over 1200 people engaged in two weeks of rolling sit-ins at the White House. The Tar Sands Action helped launch a political movement on climate in North America and turned Keystone Xl into a household name. In the summer of 2012, an unusual grassroots coalition of conservative landowners and radical environmentalists, calling itself the “Tar Sands Blockade,” launched the second major escalation against Keystone XL. Their goal was to stop the construction of the southern leg of the Keystone XL pipeline which had been approved by President Obama earlier that year. The Tar Sands Blockade saw dozens arrested, brutalized by police and sued by Canadian oil giant TransCanada in efforts to stop the ongoing disruption of work along the pipeline route. In the end, the southern leg of Keystone XL was built and today, 400,000 of barrels of oil flow from Cushing, OK to the Gulf Coast every day. But without the strong courageous people-powered resistance of the Tar Sands Blockade, the rejection of the northern leg would have been out of reach. In the spring of 2013, Rainforest Action Network joined with CREDO Action and the Other 98% to launch another major escalation in the fight: the Keystone XL Pledge of Resistance. We had a clear goal of intervening in President Obama’s decision to approval of the pipeline with a network of climate activists built out of his liberal-progressive base. Like the Tar Sands Action in 2011, we took Keystone XL and wedged it in between him and one of his primary bases of support. 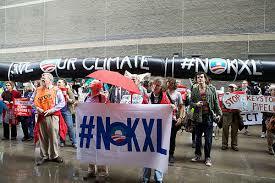 97,176 signed the Keystone XL Pledge of Resistance. A 25-city tour that trained upwards 500 people to lead actions in their cities, towns and communities. A robust network of lawyers and legal workers to support Pledge groups. Keystone XL Pledge of Resistance “preview” actions in Chicago, Washington D.C., Houston, Boston and Philadelphia that saw 64 people arrested sitting in at Keystone related targets. The idea was to give the administration a very clear idea of what was coming if Obama approved the pipeline. Pledge action leaders trained over 4,000 participants to engage in non-violent civil disobedience. At the height of the Pledge, there were 105 action teams in 38 states. All of this showed the moral urgency for the anti-Keystone cause. For now, the Keystone XL campaign has taken Democratic presidential candidate Hillary Clinton from “inclined to approve” to “I oppose it.” Oil companies have been put on the defensive and dozens of other campaigns against oil and gas projects have been emboldened across the continent. And finally, it led to a rejection of TransCanada’s permit for the northern leg by Barack Obama. More importantly, the fight against Keystone XL triggered a climate movement motivated to disrupt and stop the fossil fuel industry wherever possible. There is a diaspora of pipeline fighters who sat-in at the White House, occupied the piney woods of east Texas and signed the Pledge of Resistance fully engaged in resistance to dirty destructive fossil fuel projects. sHellNo: In the Pacific Northwest, a huge coalition of climate activists from Bellingham Bay to Seattle to the St. John’s Bridge in Portland, OR sought to disrupt, delay and stop Royal Dutch Shell’s Arctic drilling operations in the Chukchi Sea. After a number of non-violent direct actions, both big and small, Shell abandoned its initiatives in the Arctic. While the reasons for the abandonment vary, it’s clear that people-powered opposition was an important factor. Spectra Pipeline: In the Northeast, another wave of pipeline fighters has been fighting to stop Spectra’s pipeline build out in Massachusetts, Rhode Island, Connecticut and New York. Dozens of arrests have already occurred. This fight will only intensify in 2016. Enbridge: While Keystone XL faded, momentum against the Enbridge pipeline quickly escalated with actions in both Canada and the United States. In Ontario, Indigenous led actions have shut off the pipeline a number of times. In Duluth, MN, climate and student activists occupied an Enbridge office. In Michigan, the Coalition against Tar Sands continues to campaign against Enbridge. A clear pivot from Keystone XL has become the rallying cry of “Keep It in the Ground” with everyone from President Obama to Wall Street banks co-opting the slogan in the aftermath of the Paris climate agreement. While the creation of an actual agreement with a goal of emissions reductions to 1.5 degrees is progress, corporations and craven politicians will do everything in their power to undermine it. This entry was posted in Uncategorized and tagged direct action, keystone xl, resistance, tar sands. Bookmark the permalink.